Because the constant threat of drowning and depth-charges is fun! 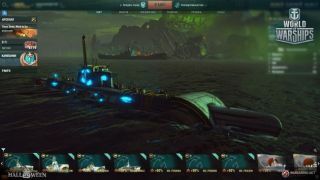 Right back at the start of its development, Wargaming was adamant about one feature that would never make it to its naval action game, World of Warships - submarines. It was too hard, too disruptive to the game as it existed, and generally… just not gonna happen. "It was not in our plans,” says World of Warships’ prodicer, Artur Plociennik, “because we never had an idea about how to do it properly. But we were thinking about it." "We ended up with a backlog of useable ideas, so we thought we'd try it." Fast forward a few years, and how times have changed. For the upcoming Halloween season of the game, submarines are just what punters are going to get. But, they’ll get them on Wargaming’s terms, as part of the company dipping its toe below the water’s surface for the first time. Bringing submarines into the full game is no mean feat, so, for now, that’s exactly what Wargaming will be avoiding. Rather, the submarine mode will be a special, steampunked-themed Halloween PvE event. Think more Jules Verne than Type XXI U-boat, with glowing engines, automated fireball catapults, and hulkingly fantastic cruisers and battleships to hunt down from the briny deep. This means that Wargaming’s devs can focus on submarine mechanics, without having to worry full integrating them into the game. As a balance issue, it’s no mean feat, and rolling out subs as a limited time event lets the company gather a great deal of data on whether or not players are even interested (hint: HELLS yes), and how the subs play, and how the mechanics actually work. So how do subs work? Well, what’s likely to eventually roll out in the coming weeks could well be tweaked from what I recently played during a visit to Wargaming’s St. Petersburg HQ. But the broad strokes should still be the same. In a lot of ways, submarines play like destroyers, constantly circling larger targets before firing off a spread of devastating torpedoes and then turning tail. But added to that gameplay are two new metrics - depth, and oxygen. Submarines can operate at four depths. They can operate on the surface, like any other vessel in the game, or submerge to periscope depth, or to two even lower depths below the waves. At each depth, they become harder and harder to detect, from being as obvious as any other ship, to nigh invisible at depth. Of course, timing those depth changes is the tricky part; you can only attack while surfaced or at periscope depth, and the deeper you are, the quicker you burn through your oxygen supply. In reality, if you were to model submarines accurately in the game, they’d be able to spend an entire match hidden below the waves, but Wargaming’s more interested in balance and drama than simulating how submarine tactics and anti-submarine tactics really worked. Managing oxygen makes those tense underwater approaches even more critical, as not does your chance to be detected go up the closer you get, but you’ll also be watching our oxygen gauge tick down to empty. You need to pick that perfect moment to get close, loose your fish into the water, and flee to a safe distance to surface, in preparation for the next run. Without getting smashed by the aforementioned fireball launchers (like, seriously, Wargaming, what even?! ), or the main guns of the ships you’re trying to sink. Or, even more dangerous while you’re underwater, their depth charges. So if you are keen for subs to make an appearance in the wider game, play the Halloween event. Play it as much as you can, and let Wargaming know.